HP Proliant DL360 G6 1U rackmount server kopen? | That's IT! Mooie, licht gebruikte, zeer betrouwbare en in perfecte staat verkerende zeer platte 1U rackmount-server. Combining concentrated 1U compute power, HP Insight Control, and essential fault tolerance, the HP ProLiant DL360 G6 is optimized for space constrained installations. 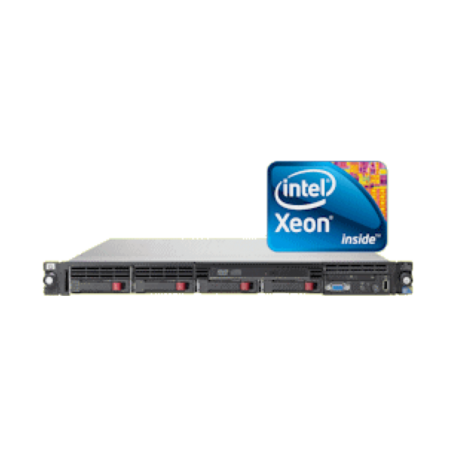 Intel® Xeon® 5600/5500 Series Processors (6, 4 and 2 core), with choice of DDR3 Registered or Unbuffered DIMMs, Serial Attached SCSI (SAS) and PCI Express Gen2 technology provide a high performance system, ideal for the full range of scale out applications. What's more, the DL360 G6 steps up the fault tolerant in an ultra-dense platform with redundant power, redundant fans, mirrored memory, embedded RAID capability, HP Insight Control for essential server management. More Performance, Capacity and Efficiency in Less Space. Up to 192GB Registered Memory DIMMS (up to 48GB Unbuffered): Memory intensive applications benefit from memory buffers, faster memory speeds, 4:1 memory interleaving, online spares and larger memory capacity. Serial PCI-Express technology greatly improves I/O bandwidth and data throughput. Two 1Gb NIC ports plus TCP/IP offload engine reduces network latency but offloading the CPU from processing network traffic. With up to eight (8) SAS drives and new Smart Array RAID controllers, you get quicker access to data and increase storage bandwidth for cutting edge storage performance.